I have found two mulberry trees on the front half of my property. The larger one I found two years ago but lost it last year. I know how can you “loose” a tree. Well I’m not that good at identifying trees from just their leaves and the fruit crop must have been low last summer. However this year you can see all the fruit on the tree from 150′ away, the tree almost has a red haze around it from all the fruit. My plan is to clear out everything around it and put down a thick layer of mulch, that way I know this tree is a “keeper” as I’m clearing the property. Mulberry trees are a desirable food source from a birds point of view. 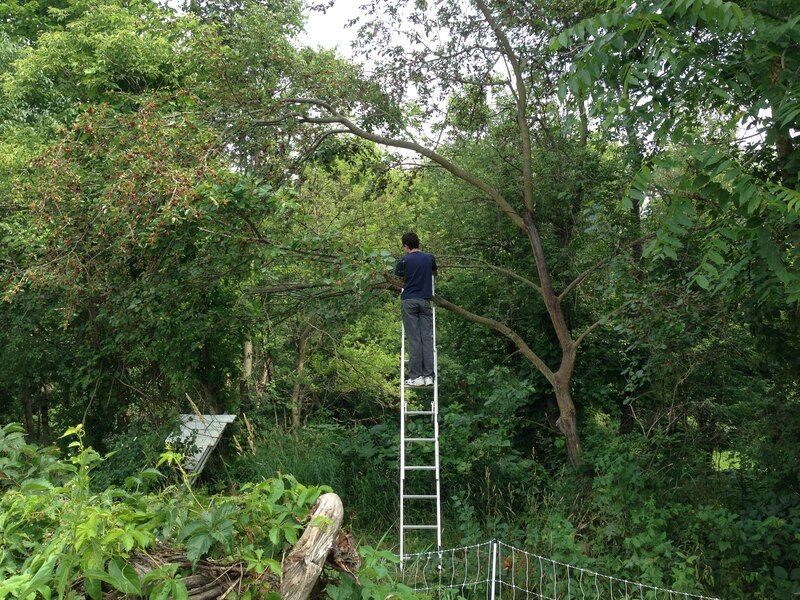 With mulberries available birds will generally leave other fruit trees alone, or at lease that is what I’ve read. I know the chickens love the dropped fruit and this is one of the reasons I moved the coop to this area so they can clean up all the fruit drop. I’m hoping the tree will develop some lower branches once I start taking care of it. This entry was posted in Clearing Land, homesteading, Plantings and tagged Backyard Chickens, chickens, mulberry tree. Bookmark the permalink.